Make your own custom stationery, greetings, invitations and announcements on our custom photo folding cards! You can design them inside out with photos and text for any occasion. Browse our collection of card templates and you’re sure to find a card design that fits the bill. As a result, you can order custom printed folding cards that compliment your style and personality. 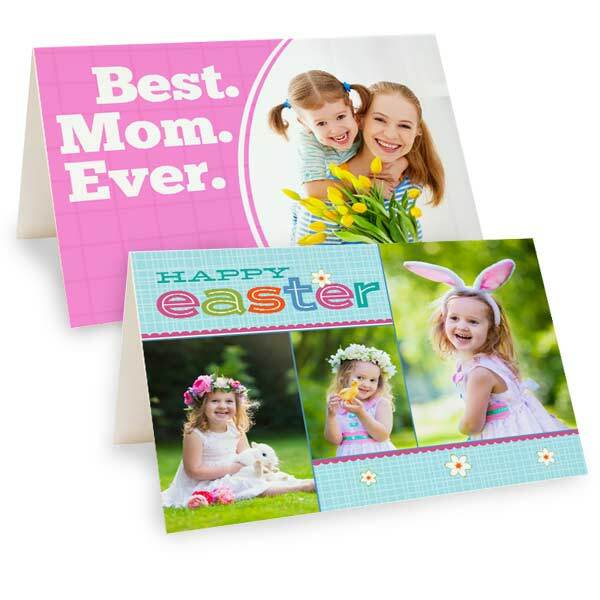 Make the perfect greeting to send Mom this year that incorporates her most cherished memories! Our folding cards can be custom printed inside out with photos, artwork, and of course, your own personalized message. Create a unique greeting that’s full of love and Mom’s favorite family photos, selfies, vacation pictures and more. When you can’t seem to find the right card at your local card shop, Print Shop lets you personalize your own for that heartwarming touch! Forego the trip to the drug store and create your own personalized Father’s Day card using your own photos, graphics, or artwork. Our folding cards can be custom printed inside out with pictures that you upload from your phone. Then, use our text option to write your own message on the inside. Custom photo cards are a great way of sharing your best memories with Dad along with a greeting that makes his Father’s Day one he won’t soon forget. With Father’s Day fast approaching, we also offer a wide array of Father’s Day gift ideas. Like our photo greetings, you can upload any picture and transform it into a personalized gift that comes from the heart. From custom photo travel mugs to personalized aprons for summer BBQ’s, Print Shop is you one-stop shop for everything Father’s Day! Graduation is an exciting, special experience, so why not create announcements and invitations to match! Print Shop has multiple stylish, colorful photo graduation announcement templates that you can have custom printed with your grad’s favorite photos! Then, add a personal message or details about your ceremony on the inside to complete your layout! If you’ve been searching for just the right grad announcement, look no further. Create your own today and have it tailored it to your needs! Searching for unique party invitations? Look no further than Print Shop Lab! We have a wide variety of photo invitation card styles to select from so you can invite your friends and family to your celebration in style. Add a favorite photo and text to complete your layout. Our customized invitations are perfect for birthdays, graduations, bridal showers, and much more. Incorporating your favorite photos into the design makes them all the more special. Planning your wedding? Maybe your son or daughter is getting ready graduation and leave the nest this year. Both occasions are perfect for designing your own personalized announcements. Design your announcements with a collage of photos and add your own text to give them a professional look. Our folding photo cards can be printed inside out to your specifications so you don’t have to worry about finding the right card at the store up the street. Just upload your photographic favorites, pick out a card style, and place your order. It’s that easy!